In Autumn last year I acquired a garden of my own for the first time. I’d never had a garden that I had control over before. 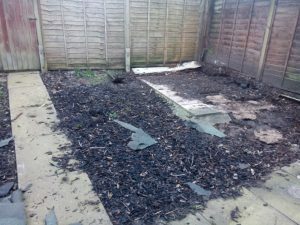 When I moved into the house the garden comprised of a shed, wooden mulch and some slabs. Initially I had no plans to change the garden, but then I spoke to Adam from BFOE. He was undertaking a permaculture diploma course and needed a few test gardens to design, plan and implement. Permaculture is a philosophy which attempts to create sustainable landscapes for wildlife and for practical use, using whatever resources are already at your disposal. This means that instead of buying in expensive outside equipment and plants, we use what we can find or recycle or reuse what we already have. I was very happy to volunteer for my garden to be included as a project for his course. Adam came around to my house and spent about four hours conducting an in depth survey of my garden, including testing the soil, the direction of the garden, the access etc. Once the survey was completed Adam went away and completed a provisional report, detailing ideas he had for the garden. We had a discussion about what I wanted for the garden. 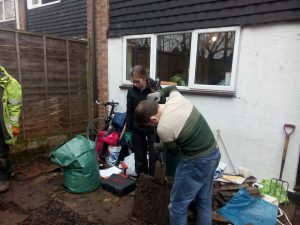 We then decided what we would attempt to create on a permaculture blitz day. The plans were ambitious and I was not sure if they were realistic. I arranged to have a permaculture blitz in my garden where we would enact the plan devised by Adam. I bribed potential gardeners with very expensive pizza. Before the permaculture blitz itself a couple of friends helped me dismantle the shed. This space was to become a pond. A few days later we had the permaculture blitz. We spent the day transforming the garden. 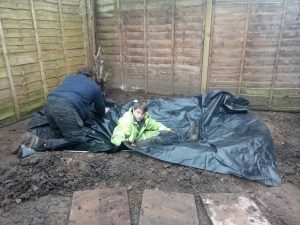 Firstly we put the pond in, using pond liner that a friend had donated and ripped up old carpet from the house. 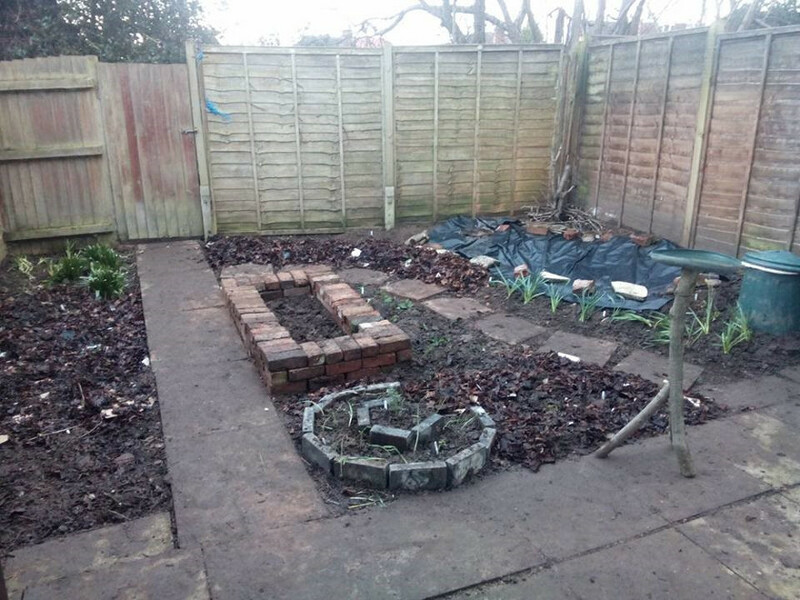 After that we used bricks that we had found in the alleyway to create a raised bed. Various plants including raspberries, comfrey and daffodils were planted. We even turned an old bin into a compost bin and a bird table. The transformation of the garden was vast. The Permaculture day was a great success. The garden is almost unrecognisable compared to prior to the Permaculture blitz. Since that day the garden has developed and is now becoming widely used by wildlife. 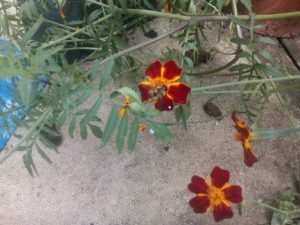 Bees now regularly visit the marigolds, birds come into the garden to drink from the pond. Most excitingly a frog was found in the pond. There have been casualties as well though. A young apple tree did not survive a summer drought as it was planted too late in the year, so will be replaced this winter. Adam has visited the garden every couple of months to make sure that the garden is keeping to the plan. The garden is an ongoing project. I have really enjoyed working on the garden since March. Before I had a garden I had very little interest in gardening, but now I really enjoy it. My garden is now buzzing with wildlife. I am now connecting with nature in a way that I have never been before. As a result of seeing so many bees in my garden I have now obtained a bee spotting poster, which is now on my living room wall. It helps me try to figure out what bees are in my garden. On top of this I have better ways of reusing resources. I now compost vegetable and fruit waste. Before they would have ended up in the bin but now they are being reused to create compost that I can use in the garden. Adam did an excellent job in planning and delivering a permaculture garden. He is available to design other gardens. If you would like an initial consultation and a quote please contact him at Adam@birminghamfoe.org.uk or look out for his start-up company Edible Gardens Brum.